Be the first to share your favorite memory, photo or story of Emilie. This memorial page is dedicated for family, friends and future generations to celebrate the life of their loved one. Emilie Ann Oehmcke Johnson was born July 30, 1929 to Viola (Klaas) and George W. Oehmcke, in Milwaukee, Wisconsin. She died on April 2, 2019 of heart failure due to age-related declining health. Emilie grew up in Wauwatosa, WI, and graduated from Wauwatosa High School. She completed her nurse’s training at West Suburban Hospital in Chicago and graduated in 1951 from Wheaton College in Wheaton, Illinois. She worked as an R.N. at the Children’s Hospital in Milwaukee. On June 17, 1955, Emilie married Russell Johnson. They lived with their 2 children in Milwaukee until Russ’ work with Youth For Christ took him to Des Moines, Iowa in 1960. In 1966 the family moved to West Des Moines, where Emilie and Russ lived out the remainder of their lives. From 1962 through 1993, Emilie operated Mid America Films, a rental library of Christian educational motion pictures. She subsequently worked part-time for Russ Doughten Films until her retirement. Her husband, Russ, became an ordained Baptist minister, and he and Emilie were involved in various kinds of religious ministry most of their adult lives. Emilie and Russ had been active members of Olivet Baptist Church until that congregation disbanded. 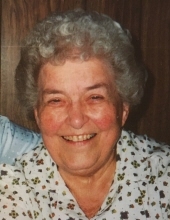 Emilie enjoyed pet cats, backyard birds, visiting with friends, travel, trains, knitting, reading, sending greeting cards, and watching shows on IPTV and “golden oldie” stations. Emilie is survived by daughter Nanette Johnson of West Des Moines; son Craig (Tricia) Johnson of Bowie, Texas; and brother George A. Oehmcke of Longview, Texas; as well as two grandsons, Steven (Kayla) and Brian; and two great-grandchildren, Olivia and Hudson; niece Angela, and cousins and other family members. She was pre-deceased by her parents; aunts and uncles; husband Russell; sister Grace; and nephew David. Donations in Emilie’s memory may be made to your favorite church, religious organization, or animal welfare charity. To send flowers or a remembrance gift to the family of Emilie Johnson, please visit our Tribute Store. "Email Address" would like to share the life celebration of Emilie Johnson. Click on the "link" to go to share a favorite memory or leave a condolence message for the family.